I have neglected this blog for a long time now. For some reason or the other, the joy of sharing recipes and need to document tidbits of my life have abandoned me. I have withdrawn into my thick, secretive shell, and the urge to remain there is keeping me away from the space which is an extension of my own life. I guess would have continued to hibernate if not for some of you who gently kicked me from my deep slumber. 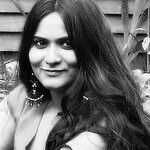 I am wondering if I should be thankful or just ignore and duck under the thick blanket of anonymity! :) Decisions, decisions… Thankfully it’s not a difficult one to make. So here I am, finally, trying to gather my scattered thoughts, flying in every direction in the wild wind of my mind. Some I manage to grab tightly in my fist, but alas, many are out of my reach! It may be because I am not trying my best to catch them, and maybe I am still not ready to come out of my secretive shell. So for now let me live in my own secret world, until the urge to share becomes strong enough to come out in open. 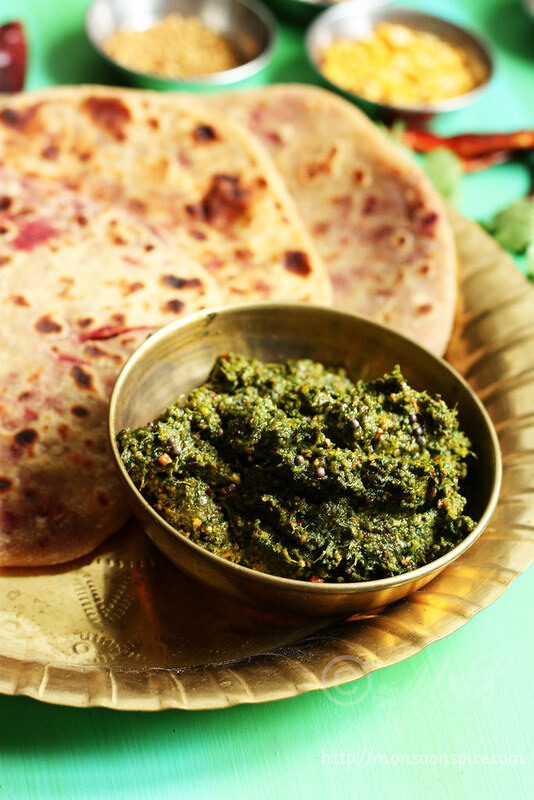 Before I crawl back into my shell and close it tight for the outside world, let me share this simple recipe for Spicy Dhania/Coriander Chutney. It is one of those chutneys I prepare when I overly get excited to see fresh greens and end up buying big batch, only to wonder how I am ever going to finish it even after garnishing every possible dish I cook! That’s when this recipe was born, out of desperation, and there is no looking back after tasting it. 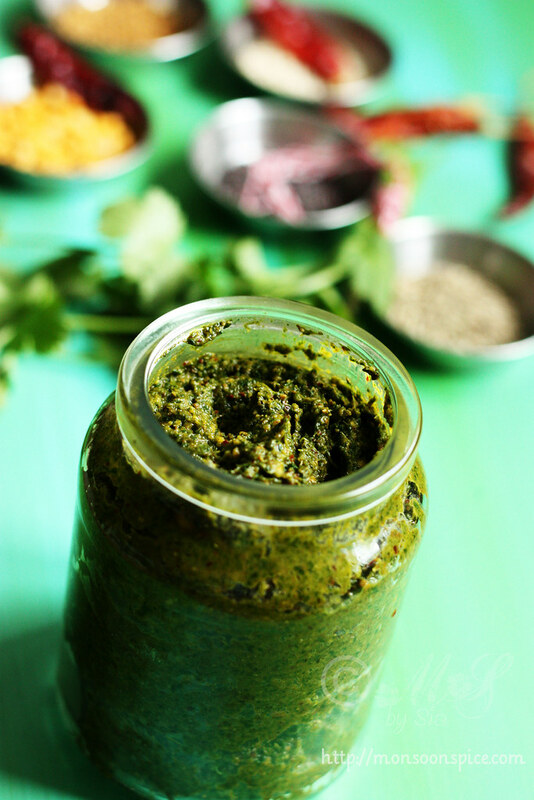 I have been religiously making this Spicy Coriander Chutney once in a month to much delight of our taste buds. 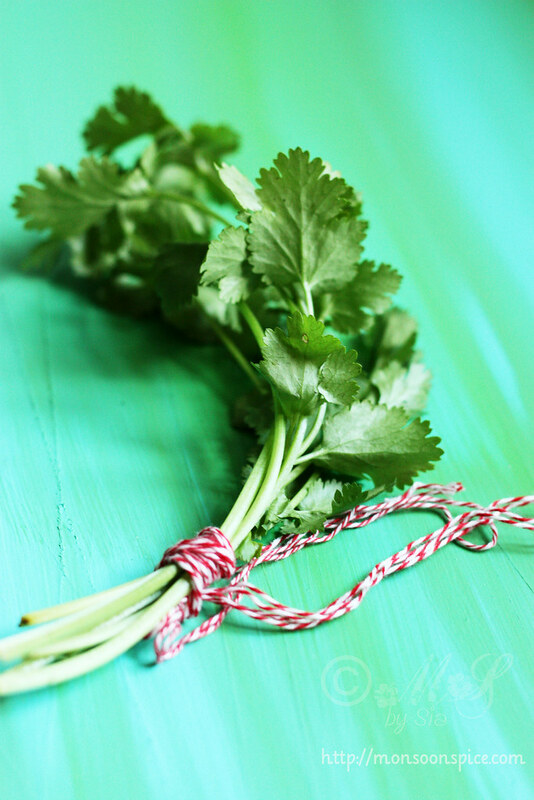 Clean and wash the coriander leaves and pat them dry with a help of kitchen towel. Spread them on a clean and dry kitchen towel to remove the moisture. Heat pan on a medium flame and dry roast urad dal, channa dal, cumin seeds, coriander seeds and methi seeds until they turn golden brown and fragrant, about 2-2½ minutes. Make sure that you don’t burn them. Transfer them into a clean and dry plate and allow them to cool down to room temperature. In a same pan, heat ½ tbsp of oil and roast the dry red chillies for a minute on low flame. Transfer them to the plate containing other roasted spices and allow them to cool to room temperature. Roughly chop the coriander leaves along with their stems. 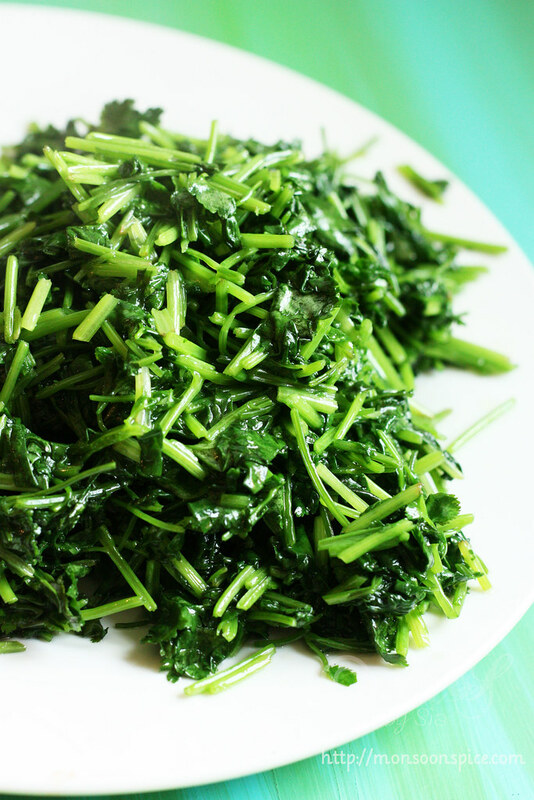 Heat the remaining oil in a same pan, and add chopped coriander leaves and stems to it. Fry them until the leaves are wilted and yet retain their colour, about 3 minutes. Remove the pan from heat and let it cool down to room temperature. Grind the roasted spices along with sugar and salt and grind them to powder. Next add the coriander leaves and grind them all together to form a thick paste without adding any water. Check for the salt and adjust the seasonings. 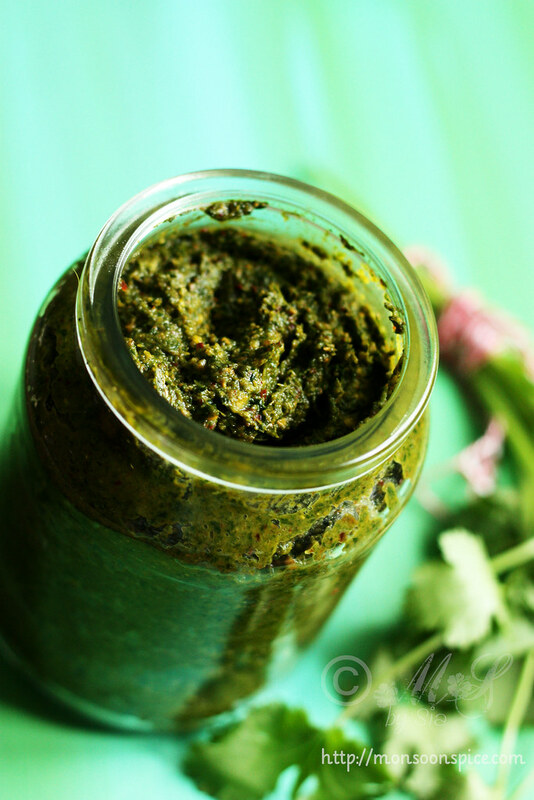 Transfer the Spicy Coriander Chutney into a clean and dry air tight jar or container and pop in a refrigerator. It stays fresh for 10-12 days in refrigerator. 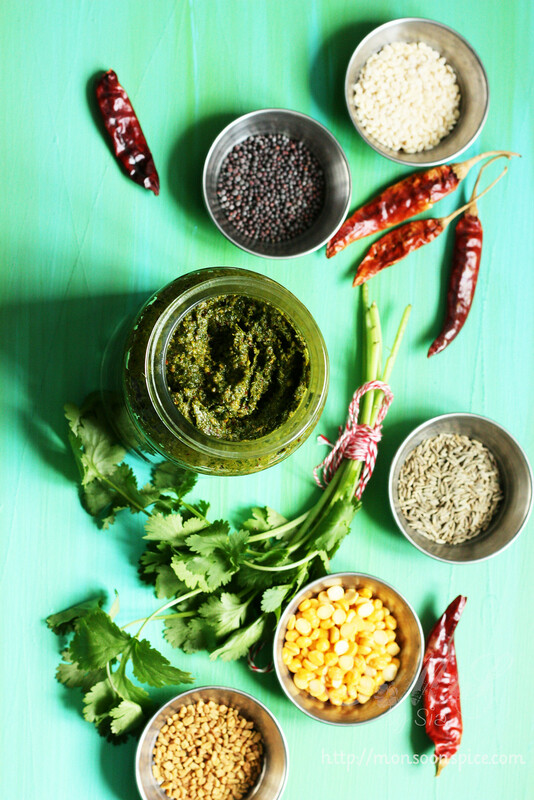 Serve this delicious Spicy Coriander Chutney with dosa, idli or any Indian flat bread. You can also serve it with rice, ghee and dal or yogurt rice. You can also use it as a spicy spread for rolls, wraps or even in sandwiches as well as spicy dressing for salads. Take care not to burn the spices while roasting. Also make sure that the spices are cooled down to room temperature before grinding. Don't reduce the amount of oil used in this recipe as it helps in preserving the chutney and hence longer shelf period. This Spicy Dhania Chutney goes well with dosa, idli, akki rotties, plain roties, parathas or chapattis. You can also serve it with rice and dal or with yogurt rice. I also use it as a spread for sandwiches and simple veggie rolls and it also can be used as a dressing for simple salads. If enough care is taken, this Spicy Coriander Chutney can be stored for 10-12 days in refrigerator. Make sure the bottle/jar/container used for storing is clean and dry without any moisture. 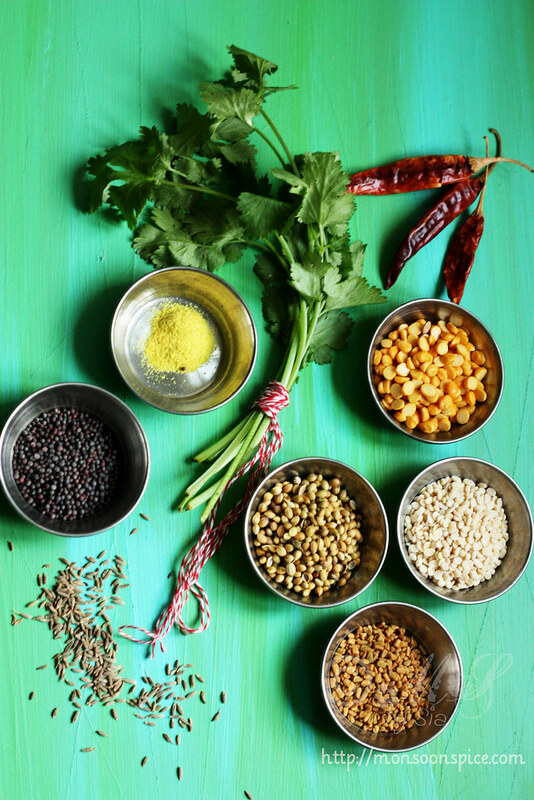 This coriander chutney sounds and looks fantastic. I'd love to taste it. That is a beautiful twist to my usual coriander mint chutney! Surely giving it a go! 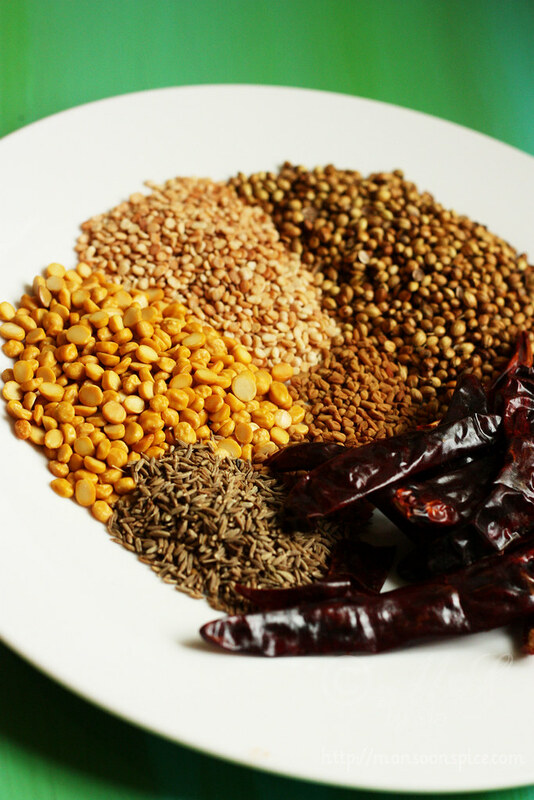 This is interesting recipe with dals and spices, i would love to make. Thanks for shaaring. Yummy n aromatic chutney..love it! When do you add the tadka? after grinding the chutney or before? I missed writing it. Thanks for pointing it Yash! You add tadka after grinding. Just mix it with the ground chutney for some crunchy texture. Hey Sia, I have always had the usual coriander chutney. You have added dals which has given nice texture and spices must have made the chutney flavourful. Will surely try your spicy coriander chutney. We had been to countryside and got quite a huge bunch of Coriander for very reasonable price.